Most of us have no problem drafting business models. Logically you believe your ideas will change the world. If you think everyone will instantly adopt your idea, then you are in for some disappointment. Compare it to the dating game: not everyone is your match. Avoid the trap of building a Cinderella product. It will take ages to find the right foot for your glass slipper! Start the other way around and find the foot first. This blog is # 2 in the lean startup series. It helps you find the answer to the first question you need to answer when starting: Is the problem I’m trying to solve worth the effort? Get help on what to test first and determining which customer segments you should start with. Using dating as a metaphor: which date is a perfect match? As a startup you search for a repeatable and scalable business model (Steve Blank) while facing conditions of extreme uncertainty (Eric Ries). What does this definition mean? It means that learning should be central to your startup. V​alidated learning is a term proposed by Eric Ries to describe the progress made when testing falsifiable hypotheses (fancy word for guesses) through one or more customer/user driven experiments. In other words, going out and changing those guesses into facts. The number one h​ypothesis is based on your riskiest assumption which has the potential to invalidate your business model or part of it. Then test your assumption and analyze the data to find patterns. So, where do you start? How do you find out whether the problem is actually worth solving? You could of course pitch the idea to everyone and see what they think! Wrong. Finding the date of your life isn’t about pitching to random people. You just can’t date everyone. A startup faces a similar reality. With limited resources and time there are a couple of essential questions: Who is most likely to love your idea? How would they solve their problems with your product? How to find the perfect dates? Not every future customer is ready for your product or service just yet. The majority of the people that you can cater to in the future won’t forgive you if your product isn’t perfect yet. Therefore it’s important to start by finding people that will love your early stage product as well – people that can help you improve the product over time. Those who don’t mind your product doesn’t have all the bells and whistles yet, as long as the early stage product is better than their current solution and they believe in your idea/vision. They have been actively looking for a way to implement a solution. They have put together a piecemeal solution. They have or can obtain a budget to spend on a solution. ￼With these characteristics in mind you need to find and recognize people that have shown this specific behaviour. Some of this behaviour is externally observable. Back to online dating: When the problem is ‘finding a fitting partner’ than the behavior is ‘creating a profile’ on channels like dating sites, Tinder and offline events. Profile your early adopters by asking yourself the following questions: What are are your future early adopters doing now to reach their goals? Which of this behavior is externally observable? Define as many of these observable behavior types. Where do we think we can find them? So now you have a fair idea of the person you want to date, the next step is assessing what the best channels are to reach people like that. As mentioned before dating provides a variety of channels. Finding the best medium to reach your specific target group, talking to others is just a w​aste ​of time. A good channel is a place that bundles a lot of people that show behaviour that leads towards solving the problem you are tackling. Think of shopping malls, Twitter, Facebook, blogs, fora, fairs, etcetera. Below you’ll find a 6-step exercise to help your team define the right channels. M​ake a list of behaviour types and list how you can observe this. Define at least three online and/or offline channels per behaviour type. Create a small experiment to test if you can see that behaviour through that channel. 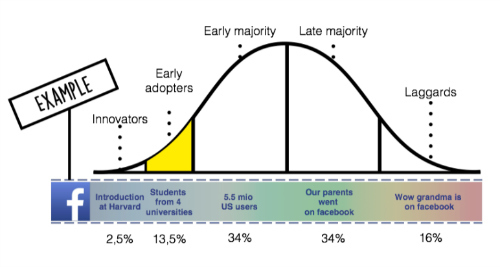 Assess if you have found enough evidence of (early adopter) behaviour. A​pproach more early adopters through successful channels and referrals. Now go out of the building, and go on a date with your special one. Every team member should do this exercise individually first. After that, all team members get together to discuss their findings and prioritise the results. Before you leave the building and go out on that date with your potential early adopter, make sure you know what you want to ask them. In the next blog post we will help you prepare the right list of questions to find out if they’re the future customers you’re looking for. Stay tuned! This Lean Startup series is brought to you by D​ouwe Wester​ and E​douard Dopper.​ Douwe is the founder of LeanUp​ and one of the mentors in the Rockstart Smart Energy and Web & Mobile accelerator programme. Edouard is founder of Office United.​ With the joint force of several startup founders, LeanUp trains and coaches startups and innovation teams to apply a series of startup methodology and help build corporate accelerators from the ground up.